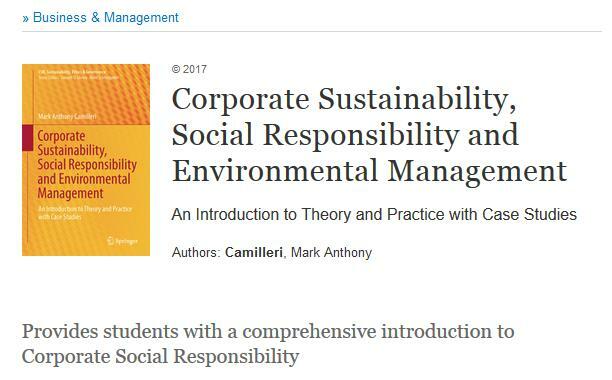 This book provides a concise and authoritative guide to corporate social responsibility (CSR) and its related paradigms, including environmental responsibility, corporate sustainability and responsibility, creating shared value, strategic CSR, stakeholder engagement, corporate citizenship, business ethics and corporate governance, among others. It is primarily intended for advanced undergraduate and / or graduate students. Moreover, this publication is highly relevant for future entrepreneurs, small business owners, non-profit organisations and charitable foundations, as it addresses the core aspects of contemporary strategies, public policies and practices. It also features case studies on international policies and principles, exploring corporate businesses’ environmental, social and governance reporting. Charles J. Fombrun, Founder of Reputation Institute and a former Professor of Management at New York University and The Wharton School, University of Pennsylvania, USA. Adam Lindgreen, Professor and Head of Department of Marketing, Copenhagen Business School, Denmark. Diane L. Swanson, Professor and Chair of Distinction in Business Administration and Ethics Education at Kansas State University, KS, USA. Donald Siegel, Dean of the School of Business and Professor of Management at the University at Albany, State University of New York, NY, USA. Wayne Visser, Senior Associate at Cambridge University, UK. He is the author of CSR 2.0: Transforming Corporate Sustainability & Responsibility and Sustainable Frontiers: Unlocking Change Through Business, Leadership and Innovation. Geoffrey P. Lantos, Professor of Business Administration, Stonehill College. Easton, Massachusetts, USA. Andreas Rasche, Professor of Business in Society, Copenhagen Business School, Denmark. Albert Caruana, Professor of Marketing at the University of Malta, Malta and at the University of Bologna, Italy. René Schmidpeter, Professor of International Business Ethics and CSR at Cologne Business School (CBS), Germany. Mark Esposito, Professor of Business and Economics at Harvard University, MA, USA. “Corporate Social Responsibility has grown from ‘nice to have’ for big companies to a necessity for all companies. Dr Mark Camilleri sketches with this excellent book the current debate in CSR and CSR communication and with his cases adds valuable insights in the ongoing development and institutionalization of CSR in nowadays business”. Wim J.L. Elving, A/Professor at the University of Amsterdam, Netherlands.